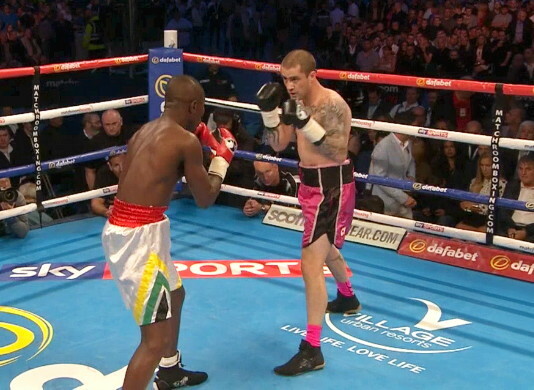 By Scott Gilfoid: Ricky Burns’ 5th round stoppage win over little known fighter Prince Ofotsu (15-5, 11 KOs) last Saturday night in Hull seems to have planted some ideas in Burns’ head. He now says he’s ready for a big fight. Burns is leaving it up to his promoter Eddie Hearn to find him that big fight for him to show to the boxing world that he’s not an over-the-hill despite having lost 3 out of his last 5 fights in the past two years. The only wins that Burns has picked up in the last two years were against little known Ofotsu and Alexandre Lepelly. That’s not exactly world class opposition, is it? There are big fights that can be made in the future for Burns, but I don’t see any of them happening in the next four months I’m afraid. Unless Burns’ promoter Eddie Hearn wants to keep him busy with another Lepelly or Ofotsu in order to prevent him from getting beaten again, it’s likely that Burns will have to sit around for the remainder of the year until one of those big names come available in 2016. Burns can’t fight Anthony Crolla because he’s busy with a rematch with Darleys Perez. Burns is now training with Kevin Mitchell, so I don’t see that fight getting made. Terry Flanagan has better things to do than to fight a 2nd tier fighter like Burns, at least I hope he’s got better things to do. Derry Mathews vs. Burns wouldn’t be a big fight. Hearn isn’t going to match Burns against Luke Campbell. Burns might be able to get a fight against Tommy Coyle, but I don’t see that as a big fight either. Coyle’s stoppage loss to Campbell last Saturday night likely knocked Coyle out of the top 15. Burns would have something in common if he fought Coyle next, but again that’s not a big fight. That would be a battle of 2nd tier fighters. Hearn can definitely keep Burns busy fighting top contenders if he wants to. I just don’t think he’ll be able to match him against any top British lightweights. Somehow I doubt that Burns will want to fight any of those guys, especially Zlaticanin, who already whipped him. Those guys are all dangerous fights for Burns, and I doubt that he or Hearn will want to take the chance of taking those fights. The thing is if Burns faces one of those guys and gets beaten, it would be his 4th defeat in his last 6 fights. Burns might think he’s proven himself by beating Ofotsu, but it would be painfully obvious that it’s over for Burns if he lost to one or more of those guys.